I wish I could tell you that I'm an organizational diva. I'm not. In fact, the office repainting project I'm undertaking is giving me hives. I love a beautiful room and design in all its myriad forms but, in reality, I'm kind of a toss it there and hope for the best kind of girl. Sad but true. It's especially sad because I have lots of lovely things that are underutilized simply because I can't find them when I need them. Jewelry and shoes are two of my favorite things and also two of my biggest problems to sort/display. My friend Tonya made a gorgeous jewelry organizer out of an old press type drawer but she's a craft genius and I'm… not. Besides which, the 105º-plus temperatures have made me rather disinclined to do anything much that would require leaving the miracle of air conditioning. So here's my compromise: I found magnets shaped like aluminum pushpins in the office supplies section at Walmart. I stuck them to my trusty ÄTRAN medicine cabinet and then hung my pretties up. Not too shabby for a minute or two of sorting. My kind of DIY project! Very cute idea! 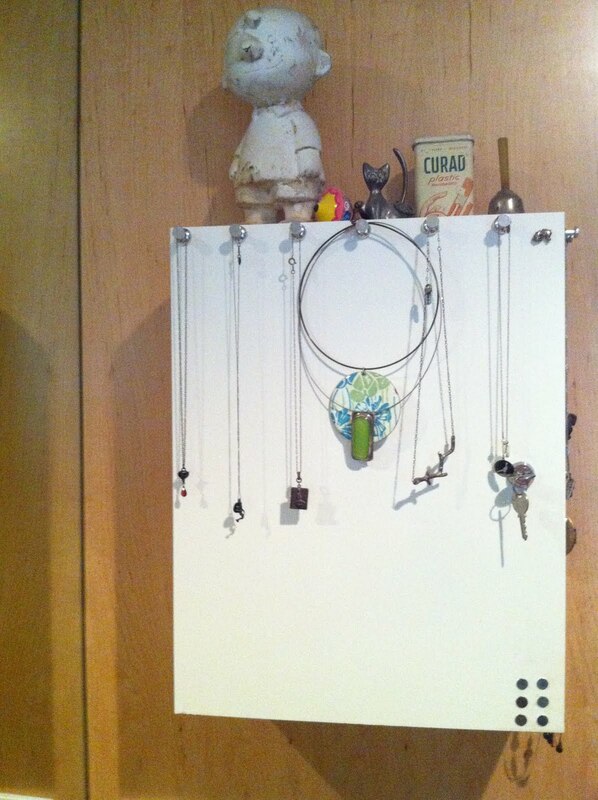 Are the magnets strong enough to hold the necklaces? Do they slide at all? I don't have many necklaces, mainly b/c I refuse to buy things I know I will not be able to store properly, and will result in never wearing again. I just got a twitter handle necklace so now I need to make something like this! I'll check out Tonya's site too! Thanks! Karen- nope, they don't slide but I am also trying to keep just one or two on each "pin" so they're not very heavy. The enamel necklace is quite heavy but it doesn't budge.